Having suffered a number of Albion Nimbuses whilst in his previous post at Great Yarmouth, Geoffrey Hilditch arrived as GM at Halifax only to find that his predecessor there had bequeathed him a batch of ten more, only recently delivered. Bought originally with the intention of operating out-of-town feeder services to and from the hilltop villages linking with double deckers on the main valley roads, the plan never really came to fruition and the Nimbuses found themselves operating through services from town to these places, as well as substituting for heavier duty single deckers on more local services. In these circumstances rather too much was perhaps expected of them and they soon began to give problems, and were generally unpopular with drivers (except Roger Cox !). Hilditch was not impressed and within two years he began to sell them off, but there was still considered to be a need for some shorter and narrower than standard single deckers to negotiate the narrow lanes and tight reversing points. He chose to repeat what he had done at Great Yarmouth and ordered some AEC Reliances with Pennine bodywork of reduced dimensions. Seven arrived for the JOC fleet in 1966 – 249-255 (ECP 949-955D) – based on the 505-engined 6MU3RA chassis. Bodies by the Seddon subsidiary Pennine Coachcraft seated 39, 252 having seats with headrests (removed from the two Nimbuses that had been fitted with them previously). 249 was even exhibited at the Commercial Vehicle Show at Earls Court in that year. They proved to be very useful on the more rural routes and were regular performers on the Heptonstall, Midgley, Booth and Mill Bank services. All passed to WYPTE Calderdale District in 1974 and were withdrawn in 1979/80. 250 was withdrawn on 31 July 1979 and sold at Central Motor Auctions the following month to Askin’s, the Carlton breaker. 251 escaped the breaker to operate for Everton Coaches of Droitwich for a while and was the subject of a sadly failed preservation attempt. 252 was exported to Malta, where it operated in a non-PSV capacity for a number of years. Here 250 is pictured in WYPTE days (1975) still in Halifax livery as it rests in Rawson Street, Halifax whilst its driver has his mealbreak in the Powell Street canteen, which was down a passageway behind Harvey’s department store on the left. Nice interesting buses-always seemed in a hurry and went fast! I recently paid a return visit to the Halifax area to see relatives who live high above Mytholmroyd on the way up to Pecket Well. After living in the flat lands around Peterborough for over 12 years I found those moorland roads, hills and twists quite challenging even in my humble Vauxhall Zafira. I have nothing but admiration for the men and machines who piloted those orange and green buses into that hinterland. Even these short and narrow Reliances must have been a tight squeeze but unlike the Nimbuses they ousted they would at least have had some power. I remember in the 70’s when I looked after the police radio stations. I was going to one near Blackshaw Head on a quite snowy day when one of these could not make it up a steep climb and had to assist in guiding the driver reversing for almost a 1/2 mile before he could turn round. I then had to walk back to where I had left my Land Rover. That’s an interesting point, Philip. Some may know better than me, but the Halifax/ Heptonstall bus has to use a turning circle to approach the steep hill up to the village. At the top the road narrows through the village and is cobbled, becoming for a bus a single width. Every sort of bus seems to have been used, though, and the whole thing certainly requires skill. Philip, I now live some 10 miles down the A1 where the Black Fens abut the rolling hills of West Hunts, and I agree that there could be no greater contrast with the dramatic Calderdale skyline than the the billiard table top topography of South Holland lying to the north of Peterborough. These Pennine bodied Reliances began to appear during my last months with HPTD in the latter part of 1966, but, being earmarked for (what was then called) OMO, they were not driven by we humble office employees who covered only crew duties. On the subject of the Nimbuses (yes, John, I loved ‘em) my acquaintance with them was always on the 46 route to Heptonstall, which, because of the unbelievably constricted terminal reversing point, colloquially known as ‘The Rathole’ – even the mirrors had to be flattened against the bus sides – these little machines carried a conductor. Before the coming of the Nimbuses, I believe that the route was previously operated with Regals, and I commend those drivers struggling over the years to turn round these bigger vehicles at the Rathole. However, I can vouch that the Nimbus did not lack performance when in good order, and could scamper up the steep Heptonstall Road from Hebden Bridge every bit as effectively as the Leopards that initially superseded them when the 46 was mercifully extended onwards beyond the Rathole to follow a circular terminal working round Heptonstall – why this route could not have been adopted long before I cannot imagine, unless there was some Road Service Licence difficulty. 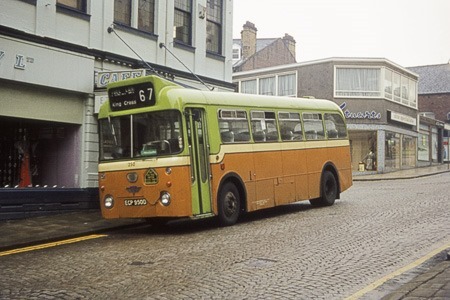 Having resolved the terminal problem, it was logical that the 46 would become a driver only operation, but, in my day, the Booth and Midgely services, which ran common with the 46 as far as Luddenden Foot, were PD2 crew runs. It would seem that they, too, soon became OMO workings with the then new Reliances. The Nimbus certainly had mechanical weaknesses, but so did the AH505 engine in the Reliance, so troubles were certainly not over. I have long thought that the fine Reliance chassis (much superior to the Leopard) should have been fitted with the superb Dennis O6 engine – we are all allowed to dream. Ah, the short Pennine Reliances. What do I remember? Clutch problems, snatching brakes, skidding in wet weather, the inevitable cold heaters and demisters, head gaskets (yes even on the AH505 engine). I have to bow to Roger and John who were there before me that the Nimbus was actually worse!!!! Provided all was working well I always much preferred the 505 Reliance to the heavy, clunky L1/L2 Leopards, though of course I wasn’t involved with having to maintain them. Cold heaters and demisters were a feature of most of the buses that I remember driving throughout my career (except during the summer months when some suddenly seemed to blow hot !). The dimensions of these reduced Reliances rendered them just right for the roads they were intended for. However, I would completely agree with Ian that Reliance brakes could be unpredictably and frighteningly snatchy, and that these short ones were the worst of all. Many of the routes they were used on were tightly timed and yet involved negotiating miles of narrow, steeply graded and winding country lanes with blind bends and shiny worn surfaces, along which numerous farm tractors with muddy tyres and leaking muck spreaders would have passed, and to which herds of cows would have added their messy contribution. All it needed then was for it to rain and you had a recipe for disaster. You had to be extremely careful, yet the running times often didn’t exactly encourage this. It always seemed to me that when a standard chassis had bits lopped off it to make it shorter and narrower it always upset the balance of things. Even worse than these Reliances were some Bristol LHS6L’s that WYPTE graced us with for a while. The LH was designed primarily as a 32ft x 8ft vehicle and may well have been okay in that form (can’t say – I never drove one). The LHS was a shorter version, maybe around 27ft 6in and sometimes 7ft 6in wide, but ours were as short and narrow as it was possible to make them, with seemingly just enough wheelbase to allow for the engine and transmission to fit, the front and rear overhangs cut down as far as they could go, and with small wheels. This resulted in a 24ft x 7ft 6in, 27-seater roller skate of a bus yet which had the same powerful 0400 engine, gearbox and braking system of the full sized version – seemingly unmodified – and all its weight distribution completely messed up. Those things really were the most fearsome buses I’ve ever driven – too much power for their own good, rear wheelspin, bouncing up and down on the back end and the brakes locking up, skidding and sliding. Terrible things.